Data Mining or Predictive Analysis - "The art of converting Data into meaningful and valuable Information". Data Mining Service is also known as Knowledge Discovery in Databases (KDD) - is an automated process to reveal hidden information in large quantities of data. Data mining is not about simple statistics or pointless number-crunching but a sophisticated, organised process capable of identifying key information which the human brain does not see or perceive. Filtering out random factors, it establishes key relations by means of advanced mathematical algorithms, converting all types of data into valid, clearly understandable information which can be directly actioned for greater success. As such it manages and builds data into a uniquely valuable asset bank for making a wide range of crucial decisions. As business complexity continues to increase, so do the quantity and complexity of data. With it getting harder to find information in gathered data, there’s a growing need for methods of intelligent machine-supported and expert-supported data analysis. 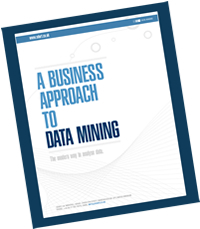 Initial advise and direction: If you would like to understand how your company can get a competitive advantage from the Data Mining service, please get in touch and we will help you with clarifying the available opportunities and options. Feasibility study service: If you already have a clear vision of how to use Data Mining in your business process use our feasibility study service to get all the facts and figures ready. We will complete an initial assessment on how the process could work, we will assess what the benefits are and if the data is complete. Finally we can the estimate the cost of implementing the process. This stage gives you a much clearer view of what you are embarking on gives you confidence in the business value of the service and a calculation of the return on investment. The Data Mining Service: Wherever you are we can take your data and convert it in to useful and meaningful information. We will start by defining the business goals for the project, then pre-processing the data. This requires several stages including: modeling, evaluation and suggestions for best implementation. DM Implementation service: Once the Data Mining analysis is complete a decision must then be made on how one would move forward. Some projects will conclude with a report, but in most cases the potential value of repeated Data Mining is clear. We can offer two distinct services either we continue to analysis the data at regular intervals or we can develop a bespoke tool that is integrated into your current I.T system. If applicable we can offer relevant training to your staff. What problem could be solved by the data analysis? What do you expect from this analysis? Better customer understanding? Lower costs? Better forecasting ability? Who will be using it in your company - which employees? Do they have the skills to understand charts or detailed information, or do they require an easily understood proposition? Are there any procedures used in this task? Can you form their precise rules? Are there any repositories that could be used as data sources? Should the solution developed be integrated with any existing software? If you are interested in finding out how this service could benefit your business, please contact us.